An interesting article from Inside EVs. Ford has dug up some data from 10,000 BEV ( Battery Electric) and PHEV (Plugin Hybrid Electric) drivers. This gels with my experience in moving from a PHEV(Ford Fusion Energi), to a BEV(Ford Focus Electric) then to my Tesla Model S. If I could do solar I would but, as I live in a rectory (Catholic parish house for priests), I cannot justify the expense in the parish budget (yet!). This article can be found in the link below. 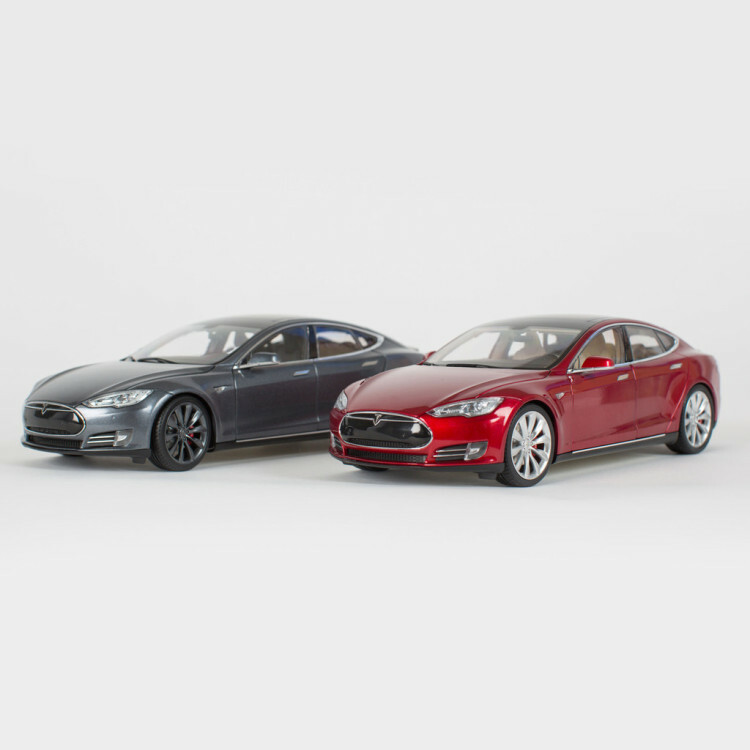 Check out this official 1:18 scale Tesla Model S. Yours for only $210. Well, I bought my second Tesla Model S today. Granted it is just a 1:18 scale model but it is a Tesla! I have a shelf just waiting for it under the Moroney Sticker framed and mounted on my office wall. I guess I am just a real fan of Tesla. The story of how change really happens. Food for thought… Not sure I agree with everything here but still worth a read and a long pondering. US EV’s are Suburban, not city cars. Today on Green Car Reports there is a post which refers to Tom Moloughney a resteraunteur who believes that EV’s in the US are suburban not city vehicles. The article goes on to describe the average ay in which EV’s are used in the USA. Indeed because of the lack of Charging points in major urban areas EVs are at a stark disadvantage to suburban areas. For in suburban areas the likelihood of a residential level 2 charger is much higher. It has been my experience that I as a commuter in the Saint Louis, MO area. I live about 30 miles from Saint Louis and regularly go into the city for work and other commitments. It is really easy for me to get into the city and back home with the range I get in the Ford Focus Electric. I even am able to run several errands if the need arises. With proper planning you can even take longer distance rides as I have done multiple times. It will only be a matter of time until someone develops an affordable 200+ mile EV. Until then I will thoroughly enjoy my Suburban Car. According to a story from the Associated Press driving an EV might not be as friendly to the environment as we think. Personally I purchased an EV because of the savings it would ultimately give me as opposed to a ICE car. Of course that was before the Oil Depression and Gas went from $4.oo plus per gallon to as little as $2.25 per gallon. My math does not work out as well with this dynamic. That being said I take exception to the results of the story. Even though I do get most of my electricity from coal fired plants, I have economized my life in so many ways that my overall energy consumption is less than before I purchased my EV. “How is this?” you might ask. Well I have become an energy efficiency fanatic at my home. I keep my thermostat set at 62 degrees except when I am at home and then only to 70 for the couple hours I am awake after getting home from work. I have changed all my light bulbs from incandescents to LED bulbs and I am only using appliances that I really need. This allows my Electric Bill to fall even with my EV charging at home. My driving habits have also changed. I am very diligent in making only those trips which are absolutely necessary. And those trips which are necessary I make as many are possible on a single trip/charge. With all these modifications in behavior I have reduced my energy footprint across the board. Thus It is my assertion that I have a lower impact on the environment than when I drove an ICE. If I ever get to install Solar Panels I will almost eliminate my impact on the environment. I have to be honest though, this is not a real high priority for me. Again I got the car to pay less per mile than I did in the ICE. Secondarily I got the car to free myself from foreign oil and its stranglehold on the American Economy. It is merely a side benefit that I have a lower impact on the environment. Read the article and make up your own mind, but I think their argument is a bit overstated and not valid in my personal experience. Sunday, 9-21-2014, at the Saint Louis Science Center for National Drive Electric Week. Cars and other Electric Vehicles from Illinois and Missouri converged at the Planeterium Parking Lot. The vehicles included everything from and Electric Bikes to multiple Tesla Model Ses'(not sure what the plural of Model S would be, forgive me Sr. Geraldine if that was wrong.). I had been hearing about them for about a year and finally got to meet them. They are very much into Solar Power, specifically by their home for its southern exposure. They have a sticker on both vehicles ” Solar Powered”. Thanks to Kevin and Peggy for sharing with me their info and experience with the Ford Focus Electric. I was parked next to some really nice folks driving the Nissan Leaf. I got to talk with them of their experience with the Leaf. Found out that we all had our EV for less than a year. We all were equally enthusiastic for our EV experience. One family even blogs about their experience, just like me. Overall it was a great experience and I look forward to next year.